A delicious blend of spices and a splash of coconut milk gives this iced tea a little something special. This Coconut Thai Tea is free of dairy and refined sugar. Optional bubble tea variation also included! In the heat of the summer, chilled fresh foods and drinks are what I crave throughout the day. I’ll take that hot coffee on ice, a salad instead of that soup, and a smoothie bowl over that bowl of oatmeal, please and thank you. This quick and easy variation of iced tea has quickly become a favorite, not merely for its beauty alone, but for its warm and creamy flavor. You can buy prepackaged Thai tea mixes, but many have weird additives and food coloring added, to give it a vibrant color. This version is much more fresh and made with a delicious blend of exotic spices, including cardamon, cinnamon, anise, and cloves. A splash of vanilla complements the spice, along with the addition of creamy coconut milk. If you’re not a fan of the spices, leave them out for a vanilla-coconut iced tea. You can also use real cream or half & half if not dairy-free. Enjoy! A delicious blend of spices and a splash of coconut milk gives this iced tea a little something special. Free of dairy and refined sugar. Optional bubble tea variation also included! Bring water and optional spices (cardamom, cloves, cinnamon, anise) to a boil in a small saucepan on the stove. Remove from heat and add teabags. Let tea steep for 4-5 minutes. Strain teabags and spices. Stir vanilla extract and sweetener (to taste) into the tea and refrigerate until chilled. 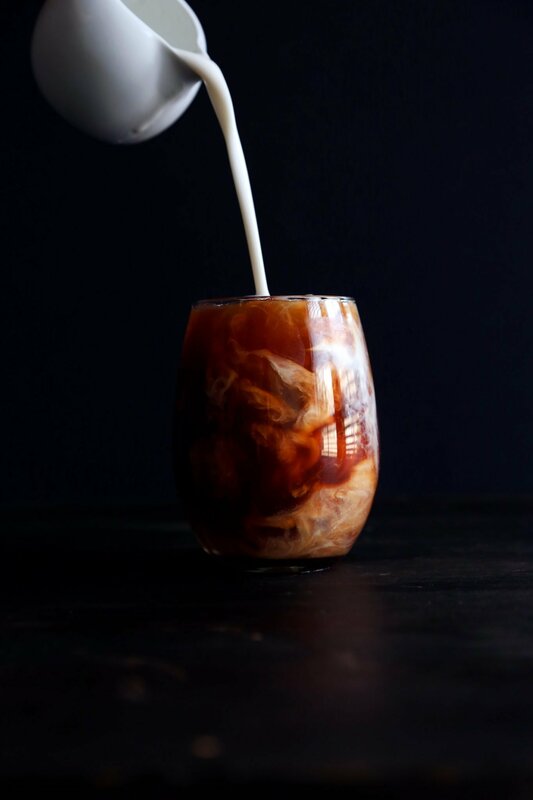 To serve, place ice into two glasses and top with cold tea, leaving enough room (1-2 inches from the top) for the milk. Mix in a little almond milk or water to thin out the coconut milk, otherwise the coconut milk may not distribute into the tea very well. Pour in milk just before serving. Serves two. Bring 4 cups of water to a boil in a medium pot. Add dry tapioca pearls and boil until they begin to float at the surface. Turn heat down to medium and cook for 15 minutes, or until soft and plump. Turn off heat, cover with a lid and let sit for 10-15 more minutes, until soft and chewy. 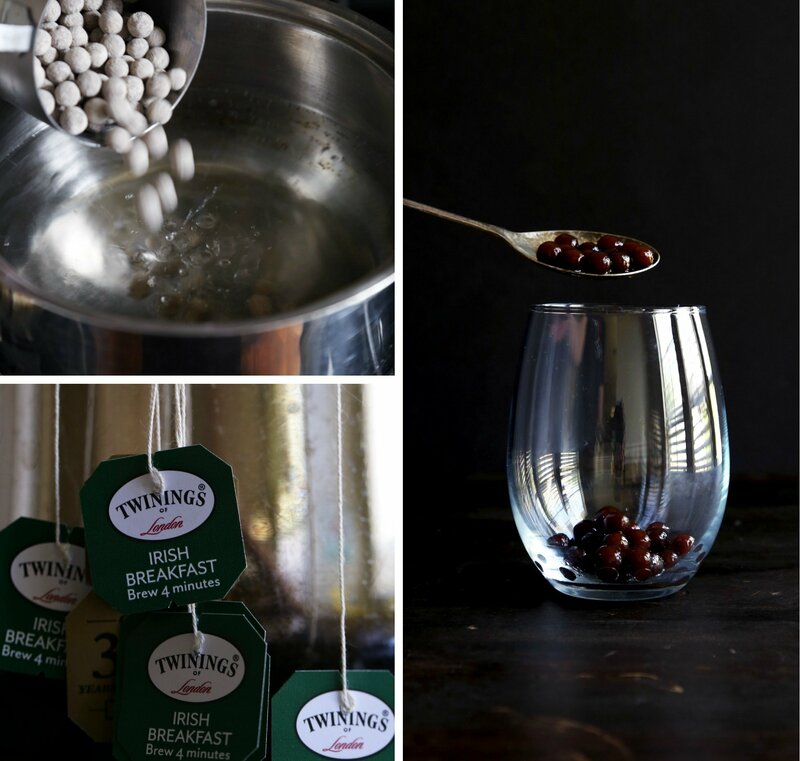 Strain water from the pearls and place into a container. Mix well with 1 tablespoon of water and honey or maple syrup. Use right away, cooked tapioca pearls don't keep very well. To add to the tea, place into the glass before adding the ice. Top with tea and milk. Makes two servings. Coconut Thai Tea – Wifemamafoodie is such a great post concerning pdf. I love bubble tea, thanks for sharing this recipe , definitely trying it! Thank you, Manali! Please let me know how you like it, friend! Have a great week! You’re really rocking those little videos, aren’t you?! Looks lovely. This tea looks delicious! I’ve been looking for a good bubble/thai tea recipe and it looks like I found it! This sounds incredible! I think I may need to make it. Thank you. Please let me know if you try it out. Have a great weekend! This sounds amazing! I’m totally going to make it this weekend!!!!!!!! Thank you, Danielle! It does make for a great combo. I hope you get to try it. Have a wonderful weekend! Oh my goodness I love your pictures especially the gif. Which gif animator did you use? I will be pinning this to give this a try! Thank you! Thanks for pinning and for your support! I created the gif in Adobe Photoshop. Do you have Photoshop? If you do, I’d be happy to send you how I put it together step by step. I’m a sucker for anything coconut and this sounds so yummy! I can’t wait to try it! Thanks, Bree. I think you would love it! Wow wow! I have been looking for a good thai tea recipe for so long, and here we go! This is absolutely divine post, Joscelyn. Can’t wait to try. You have a beautiful weekend! Am loving your videos Joscelyn! This drink looks so refreshing! I love tapioca pearl drinks, I think I am going to try this soon!! Thanks, girl! The videos are coming along. I love these types of drinks too. They add such a great twist. I want that right now. Looks so beautiful and YUM! Thank you, friend! It was so good! Oh my goodness I need this in my tummy right now. It was delicious. Thanks for your encouragement! Definitely have to try this–my son was just asking me about making Thai iced tea today–thanks! Thanks Sandi, I hope you get to try it out!